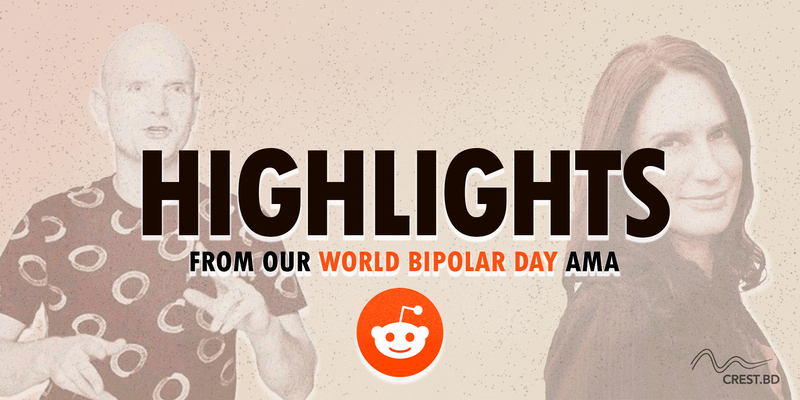 In honor of World Bipolar Day, members of the CREST.BD team led by Dr. Erin Michalak and Dr. Steven Barnes hosted our first-ever Reddit “Ask Me Anything (AMA)” on March 29, 2019. In this special blog post, we recap the full AMA event, and bring to you our favorite moments and 5 important questions. Our AMA was hosted on Reddit’s r/IAmA – a platform for question-and-answer interactive interviews. Founded in 2009, the subreddit has gone on to become one of Reddit’s most popular communities with over 19 million members. AMA interviewees have ranged from celebrities to people in various lines of work, including Barack Obama, Gordon Ramsay, and several notable appearances by Bill Gates. With the help of generous Reddit moderators, our AMA was also cross-posted to other bipolar disorder and mental health related subreddits, including r/BipolarReddit, r/bipolar, and r/psychology – helping us draw a total of over 400 questions and comments across Reddit, and making this event the largest bipolar-specific Reddit AMA to date. The vision of World Bipolar Day is to bring world awareness to bipolar disorders and to eliminate social stigma. Celebrated every year on March 30th, World Bipolar Day falls on the birthday of Vincent Van Gogh, who some believe was affected by bipolar disorder. This international awareness event is an initiative of the International Bipolar Foundation (IBPF) in conjunction with the International Society for Bipolar Disorders (ISBD). Leading up to World Bipolar Day, we received great support from our friends from IBPF, ISBD, and the official World Bipolar Day page in promoting our AMA on social media. The theme for this year’s World Bipolar Day was #ThisIsBipolar – a call for people living with bipolar to show how the condition is not a one-size-fits-all, and that people affected by bipolar disorder are diverse in their experiences and treatment journeys. Steven is CREST.BD Network Deputy, and Senior Instructor and Associate Head of Undergraduate Affairs in the Department of Psychology at the University of British Columbia (UBC). He is also a recipient of Canada’s most prestigious recognition of excellence in educational leadership and teaching at the university and college level – the 3M National Teaching Fellow award. Steven lives well with bipolar disorder, and is known for his work in supporting student mental health and wellbeing at UBC, where he is co-founder of Kaleidoscope – a peer-run support group for individuals experiencing mental health issues. Erin is the founder and Network Lead of CREST.BD, and Professor in the Department of Psychiatry at UBC. Her work focuses on enhancing quality of life and reducing stigma for people with BD. Erin’s research interests are in online and mobile mental health interventions, patient engagement in research, knowledge translation, and implementation science. For Bell Let’s Talk day 2019, Erin also hosted a live Q&A on all things bipolar – check out all questions and answers from CREST.BD’s #TalkBD event here! Experts from the wider CREST.BD team also joined in to support the AMA. This included psychiatrists Dr. Chris Gorman and Dr. Rob Tarzwell, who focused on questions related to medical psychiatric treatment, and clinical professor Dr. Ivan Torres who helped tackle questions on cognition and bipolar disorder. We would like to thank everyone who participated and sent us your questions over the past weeks, they are all great questions. A special thank you to the r/IAmA moderators and Reddit Community Manager Cassidy, UBC Department of Psychiatry and Psychology, IBPF and ISBD, and lastly, CREST.BD volunteers Hussein and Amy who helped make this possible. We’ll be back for another AMA for World Bipolar Day 2020!